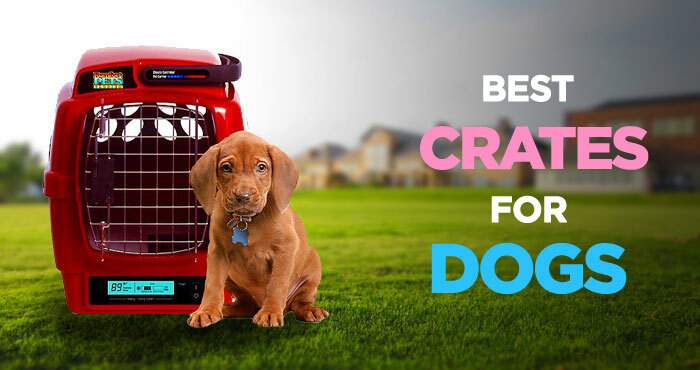 Researching the best dog crates to buy for your pet is a must-do for all dog owners. That’s what a good, high-quality dog crate provides for your best canine friend! Many dog owners ask themselves whether to get a crate for their furry pals at all. 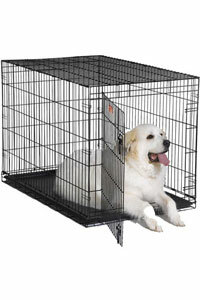 Crating is not a penalty for your dogs, and a big enough and comfortable crate will end up being a treat for your pooch. This article will guide you through the process of choosing the best dog kennel for your pooch. I’ll explore why training your dog to use a crate is important, the different types of crates, a comprehensive guide to sizing and important crate tips. Evidence shows numerous health and behavioral benefits to using a crate for your pooch. Dogs’ den instinct means that they crave a small, well-defined space, where they can spend some time on their own. They are safety devices that benefit both you and your dog. Crate training a dog to get used to his crate is great for potty training. Dogs have an instinct not to soil where they sleep so they won’t make a mess in their crates. This helps train not only puppies, but also dogs with no house habits as well! 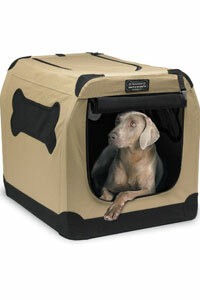 Crates also provide your dog with the possibility to be included in family trips and outings. No more travel worries and inconvenience – the crate will make sure that your dog stays safe and comfortable away from home, and the risk of distracting the driver is significantly reduced as well. Crates provide comfort and ease of mind for dog owners as well. With a crate, you can confine your dogs if there’s too much activity or confusion in their surroundings, leave them in your house unsupervised, or avoiding a lot of outdoors-related bad behavior. The style of the crate that you pick depends on how mischievous your dog is, what you want to use it for, and whether you want it to fit with the style of your home. 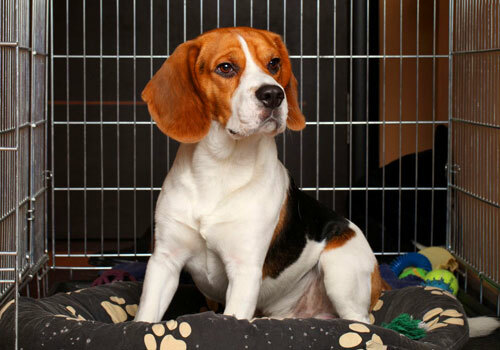 There are four main types of dog crates, and they all come with many different advantages. 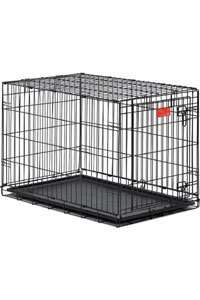 Wire dog crates are the most commonly used type. Standard models only have one door, but some may have more than one for ease of access. 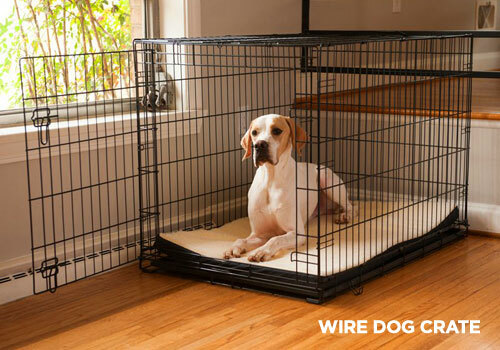 Wire dog crates are very easy to keep clean, which is really important, especially when potty training your dog. They also offer very good air circulation. The railings of the wire crate and its general openness allow for your dog to see everything outside and be easily seen as well. 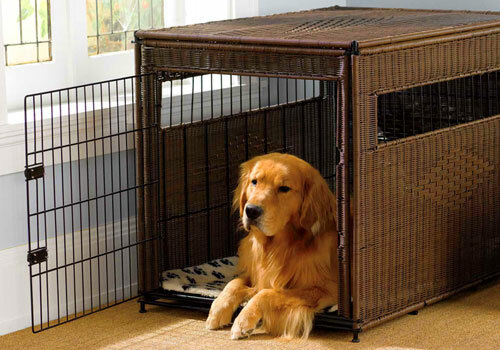 If your dog is more the introvert type and wants a moment to himself, the wire crate can easily be covered to create a moment of privacy. A lot of models can be folded for ease of portability. 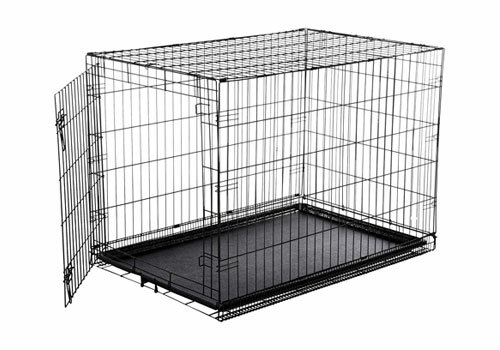 They can also come with divider panels to adjust the size of the crate for your growing pup. 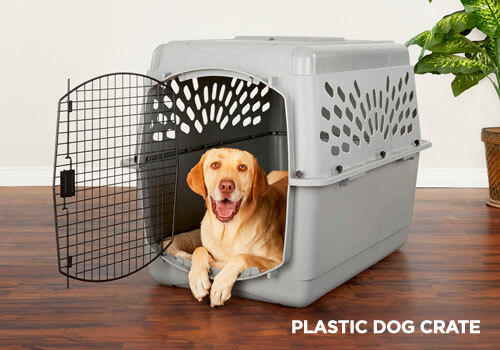 Plastic dog crates are most commonly used for travel. Some of them are even aircraft approved. They are a lot lighter and easier to transport and are more sheltered and insulated, offering your pooch a warm enclosure in the colder months. Those crates are a great help for dogs that are overwhelmed and anxious by a lot of activity around them. 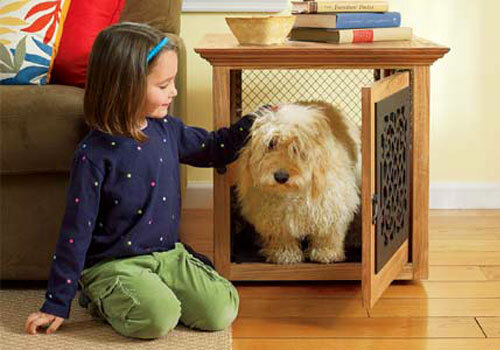 By reducing their visibility, your furry friend can easily calm down in the safety of the crate’s enclosure. We know that dogs are cunning escape artists when it comes to crate doors. Plastic dog crates have a more difficult mechanism, which makes escape very hard, if not impossible for even the shiftiest of pooches. Wooden dog crates are very stylish and comfortable and steadily increasing in popularity. Perhaps their biggest advantage is that they can be picked to easily fit the style of your home. 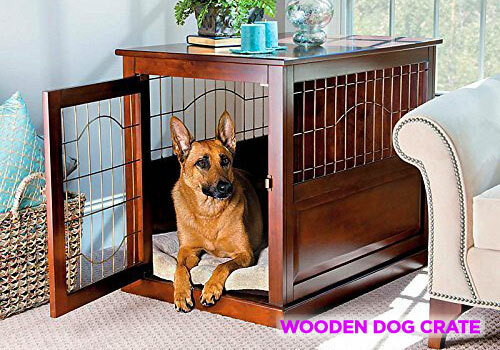 Forget the need to look for an inconspicuous space to put a large dog crate for your pooch, or for having to put its crate in another room. With wooden dog crates, your dog can easily chill in the living room with you, enjoying some of his favorite family time. This can be upgraded to an end-table style crate, which doubles up as a functional surface and blends in with the room completely. Fabric crates are perhaps the least intimidating option for first-time dog owners, who might feel that the other types of crates are too unwelcoming. 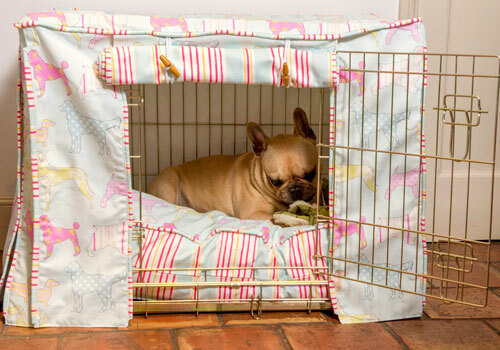 Fabric crates are often more suitable for dogs that aren’t jumpy or easily excitable. They are very lightweight and portable, and most models come with a handy carry-on bag for easy transport. Fabric crates also provide perhaps the biggest level of comfort of all types because their walls are also made from soft materials and your pooch has the flexibility to move however it wants. Fabric crates are the number one choice for camping trips with your dog as well. Which Type of Crate is Best? From all these options, the collapsible wire dog crates are by far the best crates for dogs. During their long teething stage, puppies will chew anything that falls within their sight. Compared to other types of crates, the metal wires will easily withstand the destructive chewing onslaught. Same goes for potty training – wood, plastic, and fabric can be notoriously difficult to clean and get unpleasant odors out of. The metal wire crate makes everything easier as most models come with a pull out tray for easy cleaning. 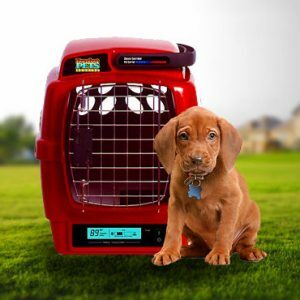 Thanks to their simplicity and sturdiness, wire dog crates are significantly less expensive than others and will probably outlast them as well. They are easily adjustable to the size of your growing pup with moving panels and, if needed, can be covered to provide some privacy or insulation from bad weather. 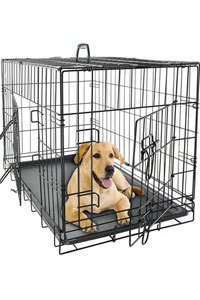 Wire dog crates are also very easy to transport and store. 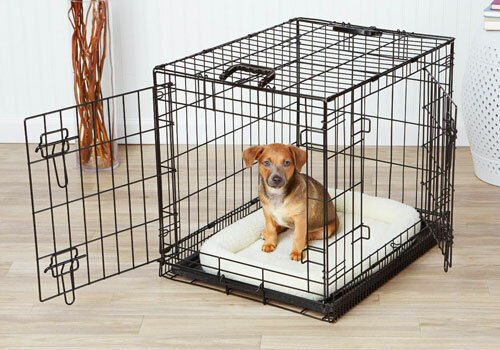 Determining the correct size of crate for your dog is very important so that he can feel comfortable and move freely in his safe space. Your dog should be able to stretch out and lay on his side easily. One thing owners should avoid is buying too large a crate. You might be thinking that you’re doing your dog a favor, however, your pooch will just use the leftover space as a bathroom. The best practice is to measure your dog and figure out the size of the crate it needs by its length and height. Measure the length of your dog when it’s standing up. Start from the tip of the nose and measure the distance to the base of the tail (note to measure to the base not the tip of the tail!) Then add 3-4 inches to the measurement to get the perfect crate length. 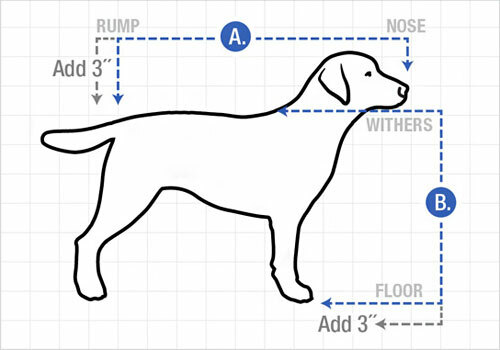 Next, sit down your dog and measure its height – distance from the floor to the tallest point of his nose or head. Add 3 inches to get the height for the crate. This is the correct way to measure your dog for a crate that fits him perfectly and suits all his needs. Remember to measure your pooch’s height when he’s sitting rather than standing– some dogs are taller when they sit! How to Choose a Best Crate for Puppy? The best puppy crates on the market will have the option to be resized as your pup grows into adulthood. Some first-time dog owners may feel tempted to buy a small crate and then keep upgrading it. This can become quite pricey over time. The smartest way to go about it is to get a crate for an adult dog (consult with the Internet or a specialist about the average size of your particular breed) and purchase dividers. Those dividers are available for free with most models of crates. These come in the form of removable wire panels that can reduce the space of the crate itself. A wooden board or a sealed cardboard box will also do the trick. That way, you can keep the same crate as your pup grows into a big dog. This option is an easy and cost effective decision for a puppy crate. There can be as many different crates on the market as there are dog breeds. It can get quite confusing, especially if you’re a first-time dog owner, or have never crated your dog before! That’s why we’ve compiled some tricks to remember how to choose the best, most comfortable den for your furry friend. Size is by far the most important consideration to make, in order for your dog to feel comfortable and safe in his crate. Remember, not too small, but not too large either, to avoid the risk of your dog using one end as a toilet! Foldable crates are far more convenient and flexible than other types. That all depends on your own preference of course, but it makes life a lot easier when you’re traveling or want to store the crate. Wire mesh needs to be just the right amount of thin and thick. A too thin mesh is a telltale sign of a low-quality crate and can be broken quite easily. Thick mesh, on the other hand, can impose some serious risk for your dog’s vision when it’s inside. Stainless material is always preferred, as exposed metal can be unsafe. The wires of the crate should be coated in a high-quality finish that’s not only easy to clean, but it’s also safe for your dog to chew. Rounded points are very important as sharp edges can lead to your dog hurting or cutting themselves on them when they’re having a hyperactive moment or trying to chew. Feeling overwhelmed by all the crate info? Not sure which one to go for? Fear not – we’ve handpicked three stellar options for you to suit all your dog crate needs. Check the best dog crates reviews in 2016. The Midwest iCrate Dog Crate is sturdy and reliable, designed around the comfort and safety of your dog. The set up is beautifully simple, with a fold and carry configuration that doesn’t need any tools. This crate’s door is secured with slide-bolt latches even from the sneakiest of canines. All of Midwest dog crates corners are safely rounded, to make sure your furry friend is safe from hurting themselves on any sharp edges. The rails are complete with a durable stylish black finish that’s easy to clean and safe for dogs to chew. The crate comes with a removable plastic panel for ease of cleaning and a free divider, so the crate can also be used for growing puppies. It’s incredibly easy to transport as there are plastic handles included, and it’s light enough for anyone to carry. It’s an affordable, effective option for all to-be-craters, who want to ensure their dog is comfy, clean and happy. Click here to buy Midwest iCrate Single Door Dog Crate on Amazon. The OxGord Double-Door Dog Crate offers a creative, easily transportable design that gives your dog the freedom and flexibility to use an alternative side exit. This crate is a lot lighter than other models as it’s just as easy to set up and fold away as an item of clothing. It folds into a package that’s 4 inches tall, and it’s easy to store and transport. The sturdy materials it’s made out of will make sure it endures even onslaughts of teeth on its rails, and the rounded edges will make sure your pooch doesn’t get hurt on any exposed metal. It comes equipped with a slide-out tray for easy cleaning and the quality rail finish can withstand rust, corrosion and fade even in the most extreme of climates. 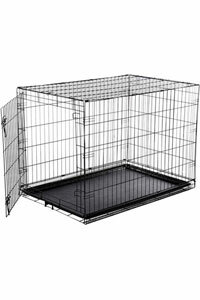 This crate also comes with a free divider panel for puppies, and its mesh isn’t too thick nor too thin. Click here to buy OxGord Double-Door Dog Crate on Amazon. 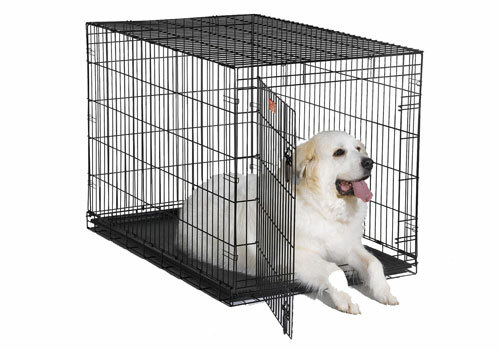 By far the most cost-effective option on the list, the AmazonBasics Single-Door Dog Crate doesn’t compromise on quality. It has a single swing door at the front, which allows for easy, comfortable entry for your dog. This crate is equipped with not one but two slide-bolt latches, ensuring that even the most cunning and determined of dogs won’t be able to open it from the inside. It has rounded corners throughout, and the durable wire construction ensures excellent air circulation for warmer climates. There’s also an included free divider panel, making sure that your puppy is safely confined and doesn’t make a mess in the empty space. It’s fully collapsible for easy storage and transportation and painted and coated throughout. The AmazonBasics crate is sturdier and safer than other crates of a similar price, so it’s perfect for those who don’t want to spend a fortune on their first crate! 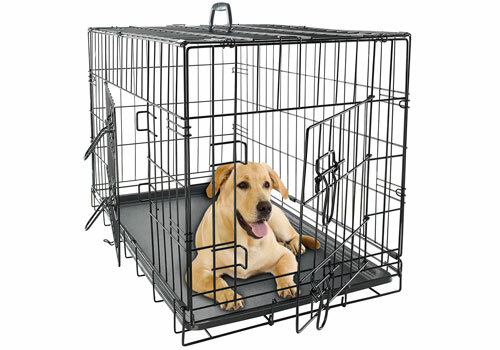 Click here to buy AmazonBasics Single-Door Dog Crate on Amazon. Here are several tips to follow to make sure your dog loves its crate and doesn’t see it as punishment, or, even worse, neglect. Don’t close the door for too long. A closed crate door all through the day makes for an unhappy and unhealthy dog. Only close the door when crate training a dog and then leave it open, so that he can choose to go in rather than feeling forced. Sometimes you need to crate your dog to prevent destruction to your home – when going to work for example – but if you do, always make sure that your dog is allowed to stay out when you’re back. To avoid potty accidents, dogs under six months old shouldn’t be in their crate for more than 3-4 hours. The crate is not punishment. Your dog chewed on your favorite sofa or made a mess of the new shoes you need for tomorrow? Be firm but don’t throw it in the crate to punish him. This is a surefire way to inspire crate-hate. Don’t crate the dog in a parked car in hot weather. We can’t stress this enough. Cars can get dangerously hot in warm temperature and crating your dog in a hot car will make it very unwell. This is a punishable offense in some places, but is still sadly something a lot of dog owners do. When training’s done, make crate time optional. If your furry friend has had a positive crate training experience, they will look for it themselves. Encourage them with some fluffy bedding and squeaky toys. Always make sure the crate is affixed to either the seat or the floor. There has to be enough air circulation to keep your dog cool and don’t pile things on top of the crate. People still have a lot of doubts and questions about crates. I’ve compiled a list of the questions you hear most frequently, but if you have any others, feel free to pop them in the comments section below this article! Why should I get a crate for my dog? Experts agree that crates have a lot of benefits for your dog. Crates are not cages, and they encourage your dog’s natural denning instinct. They make crate training a puppy a lot easier and can improve your pet-owner relationship immensely. It’s also a great place for your dog to have some down time. Yes, as long as it’s close to where you are. Commands like “kennel” are useful to train your dog to know its bed time and use the crate to sleep. Just make sure the crate is close to your own bedroom so you can hear the dog if it’s whining. No dog should be crated full-time. 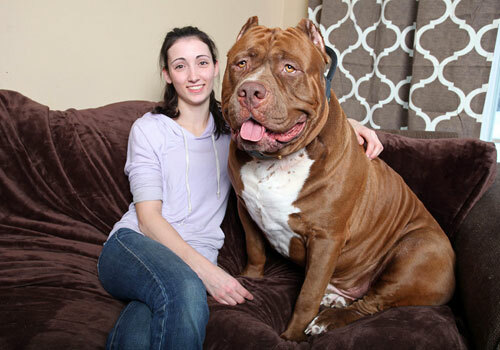 No matter what its breed, size, or age. Dogs are very social animals and even four consecutive hours in a closed crate are too much. With the exception of the nighttime, crating dogs for very long periods of time is a big no-no. Can I use a crate for puppies? Yes, but use with caution. Puppies should spend no more than two to three consecutive hours in a crate (excluding nighttime) because that would break their natural instinct to not soil where they sleep. Puppies would also need to be let out during the night, as they can’t hold their bladders. Never use your crate to punish your dog, as that will lead to crate-hate. 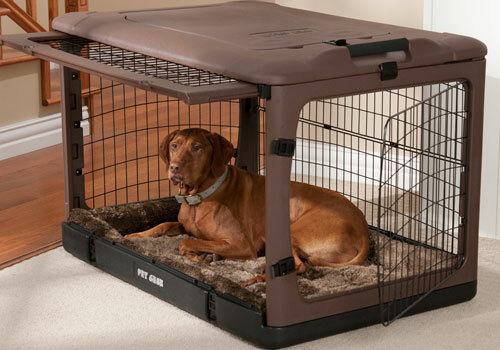 The crate his safe space and your dog shouldn’t be scared of it. It’s also not recommended for dogs with separation anxiety issues, as they can injure themselves trying to get out of their crates. Crate training a puppy has a lot of health and behavioral benefits. It can help with potty training or saving your furniture from chewing onslaughts. By training your puppy to use its crate, you’re accommodating its natural instincts and teaching good indoor habits. Just make sure you take some extra precaution before crate-training your dog. It’s very important to choose among the best dog crates on the market. The crate should be the right size and made of high-quality materials. If your dog has separation anxiety, then a crate might not be a good choice. With the right consideration, your crate-trained pooch will be healthy, well-behaved and enjoying its very own safe haven! Do you like this guide? We have more awesome guides like this, such as the best flea collar for dogs to protect your pup from both fleas and ticks. Midwest iCrate Single Door Dog Crate was reviewed by Brian Hersh on June 23, 2018. *Disclaimer: Our review on dog crate is based mostly on our expertise and the experts/veterinarians we consulted with and the information provided by the manufacturers. We do test many products, but it’s not possible to test them all. As such, please remember the above recommendations are our opinions, and before using any treatment, please consult with a local veterinarian.